Murray with a beautiful backcountry brown trout. Opening Day, of what we used to regard as the high-country water, is always a special date for the keen ﬂy ﬁsherman – November 1st in the Southern Region, but in Canterbury the ﬁrst Saturday in that month to give all the working anglers an equal opportunity. Our planned trip up Lake Te Anau was delayed by the arrival of a couple of old ﬁshing mates who had returned to ﬁsh the Eglinton River. Their overnight stay only added to the enjoyment of the occasion. Perfect morning and an early start up the valley, to find the expected gin-clear river to be a little high and somewhat cloudy, probably from snow runoff and the rain on the previous Saturday. However ﬁsh were found, though they were a bit reluctant and we all enjoyed our day, except for wading wet in the icy water, colder than usual due to the exceptionally heavy snowfalls that winter and the snow still being on the tops. I returned home mid-afternoon to pack the boat and after a quick meal we set off with still an hour of sunshine left. A steady speed into a fairly strong head swell had us arrive at a small sheltered beach just inside the North Arm (Fiord), Lake Te Anau just on dark. The second day of the season is seldom as good as the first, but after a late start up the lake and passing numerous boats on the way we finally moored on one of the better-known rivers with not another boat in sight. We knew that this was the destination of other anglers who had left earlier in the week but after a casual stroll up the track for a couple of miles we were surprised by the lack of foot-prints where they should have been evident on some of the sandy edges of the river. A little over an hour up the track we decided that the time of day was right to tempt an unwary trout with a nymph or maybe a dry fly. I think the sandflies had been ready and waiting since last year’s anglers as they were there in their droves and for the new season. I had great difﬁculty sitting on a comfortable log mounting a large dry ﬂy on a dropper above a small weighted nymph. Finally ready for action I moved to the water’s edge scanning the most likely part of the run. In my haste, I moved a good looking fish out from the edge but it was still visible in the centre of the faster water in the run. Four or ﬁve casts in the general direction resulted in a snap decision by an unseen rainbow, hooked in the upper lip by the imitation mayﬂy larvae. After a careful ﬁght, as I was still using the 4X leader of the day before on the Eglinton, I ﬁnally beached a nice rainbow of about 5lb. Having released my catch I looked around for what was next. The ﬁsh I had seen ﬁrst appeared to be still feeding in his original position and after about ﬁve or six changes of nymph, I finally convinced him to take. He was a beautiful brown, closer to 7lb than 6, – a lovely bronze colour and in perfect condition considering the time of the season. After a quick photograph, he too was returned to the water like the ﬁrst rainbow and took off in great haste. No careful resuscitation required, as prescribed in many ﬁshing publications. The ﬁsh in this river on release will very often half soak you with their broad tails in their endeavour to regain their former territory. After walking above a large beech tree left stranded by a previous ﬂood another similarly bronze coloured fish was visibly feeding. Now having the right nymph for the day it should have been easy. This fish chose to ignore what was so inviting to the previous fish, and the next four or five changes also, but when finally hooked took off after only a few minutes of capture when the hook parted company. Thirty yards up the beach a fairly identical looking trout was moving as if he could be tempted. Again after several charges of the sinking nymph he ﬁnally made a sudden decision and pounced on the large Royal Wulff which had probably ﬂoated over his head ﬁfteen to twenty times. This ﬁsh left around the pool like a rainbow but he was probably the best fish of the day and taken on a dry ﬂy. I still didn’t feel conﬁdent to discard the nymph for the dry ﬂy only, which in my opinion makes for more enjoyable fishing, so, thinking that one swallow doesn’t make a summer I carried on with my dual rig. Moving upstream I fished to another three or four fish with no luck and that was the end of our fishing without having to make an icy crossing in the clear cold water. Surprisingly I didn’t think it was as cold as the greeny snowmelt water of the Eglinton the day before when I thought my legs and feet were going to drop off. Once out the other side, with still no boot marks on the sandy edge, we came to attractive looking water, though the ﬁsh’s reaction to my casting was as if they had been fished the previous hour. With more feelings of hunger than frustration, we found a comfortable log which was a good observation point where we could eat our lunch while watching downstream for any approaching anglers and upstream the feeding of three nice ﬁsh in a fairly shallow run. Having satisﬁed the most pressing demand for food I felt a lot more relaxed in my next approach. think he had seen enough as he had moved out. way slowly upstream through shallow water between the large swede-sized stones. I managed to drop the large dry ﬂy indicator more or less right on his nose. To my surprise instead of making a bolt for the deep water, he made a perfect slow-motion rise and was duly hooked. Due to the shallow water he couldn’t put up half the fight I’m sure he would have been capable of but he was still a beautiful fish. By this time it was wise for us to head down river back to the boat but just a couple more casts into a shallow run, where I had never caught a ﬁsh previously, to my surprise a small rainbow latched onto the nymph and really put on an act, similar to some of the Waiau fish in the days before the Dam. This was an unusual fish of probably under 3lb, but it was in excellent condition and full of fight. The next couple of runs showed excellent stock but I think we had had the best of the day as the fish showed little interest in my approaches. That day was going to be a hard act to follow, and Murphy’s Law dictated a chapter of accidents for the third day, the reason (or excuse) for which was to become clear later on. The first thing the next day we thought we would change location, but the other river at the head of the Lake proved on our arrival to be discoloured, so back to the river of the day before. By now, of course, there was another boat in evidence and four anglers ahead of us. Having had a good day the day before we thought we’d explore some of the lower reaches. Very few fish appeared to be in the accessible places and by the time we reached the ﬁrst spot of the day before and I had started ﬁshing where I knew there were ﬁsh, one of the reasons appeared. A lone angler who had been just ahead of us and had had good results. His mates were well up ahead so we left him to carry on up and thought we would walk on up to the hut, a mile or so up the river. Before this while attempting to cross the river to look up a side stream I lost my footing on slippery rocks, only just managing to save myself form a thorough wetting and being carried downstream by the fast water. Not long after this, I sunk a hook into my finger which necessitated an on-the-spot extraction and a wound which required first aid. Already not a good day. which followed, rather glad that we were away from any large over-hanging rocks or cliffs. An earthquake, no wonder the ﬁsh were out of sorts. During a big ﬂood in the river a few years ago the warden’s hut at Clinton Forks had been swept away and the river cut into the bank perilously near the accommodations huts, forming a new riverbed which, according to recent reports had some good ﬁshing, but it is littered with debris and extremely difﬁcult to negotiate. We did struggle through, however, only to ﬁnd that the water here was becoming discoloured, most likely due to avalanche and landslide debris resulting from the earthquake earlier. track. It was late enough and we had about 5 miles to go back to our boat for our last evening away. The lack of ﬁsh was due to the weather we decided, deﬁnitely, but we have never seen so many sandﬂies, ever! What a wonderful place, but how much better Fiordland back country trout fishing would be without the sandﬂies. Trolling slowly down the lake the next day resulted in only two small ﬁsh, but there was another earthquake that day so we again had a good excuse for our small tally. Just as skiing is a wonderful, easy way to be a mountaineer, a ﬁshing trip is a great excuse to enjoy the outdoors and the beautiful riverside and mountain stream country of New Zealand. 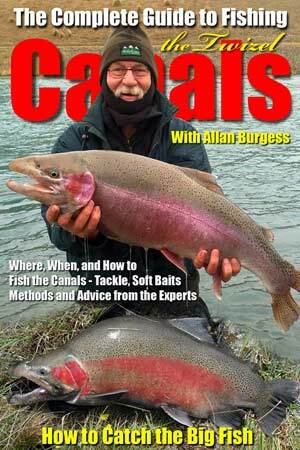 For the non-ﬁshing partner or wife of the angler, the outdoors provides a very pleasant day. I like to sketch and photograph the scenery and sometimes I write a poem, and just to take in the surroundings, study the plants, the rocks and the river pools is a wonderful way to fill in a day, away from household chores, letter writing and bill paying or being at the beck and call of family or committees or whatever. or two away. Fiordland back country trout fishing. More info on fishing at Lake Te Anau. 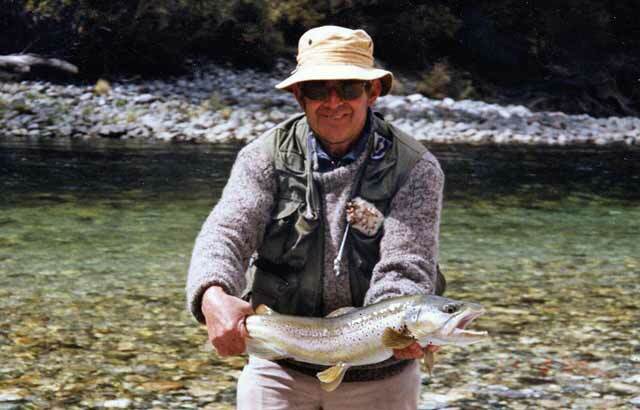 Find out more about trout fishing in Fiordland at Fiordland OutdoorsCo.